EPBOT: Star Wars DIY: We Built BB-8! For Cheap! Ready to see part of what John and I've been working on the past few weeks? Not the whole thing, of course, but at least a little of it? First pretend you didn't read that post title for a sec. You know, so you'll be surprised. As you can see, this BB's been through a scrap or two. 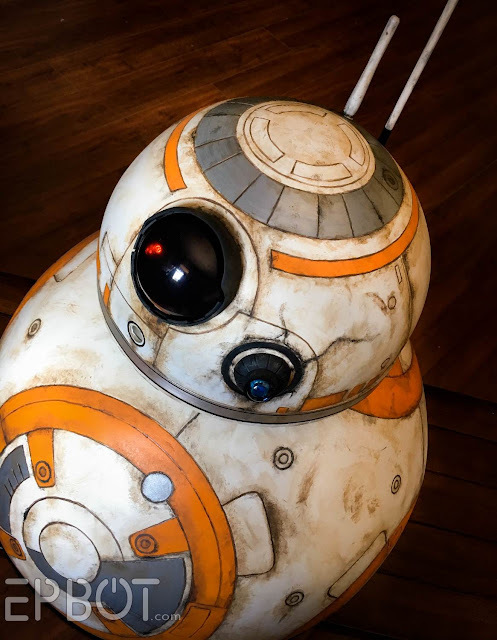 Never fear though, he's a tough little droid and will have a lively conversation with you if prompted. 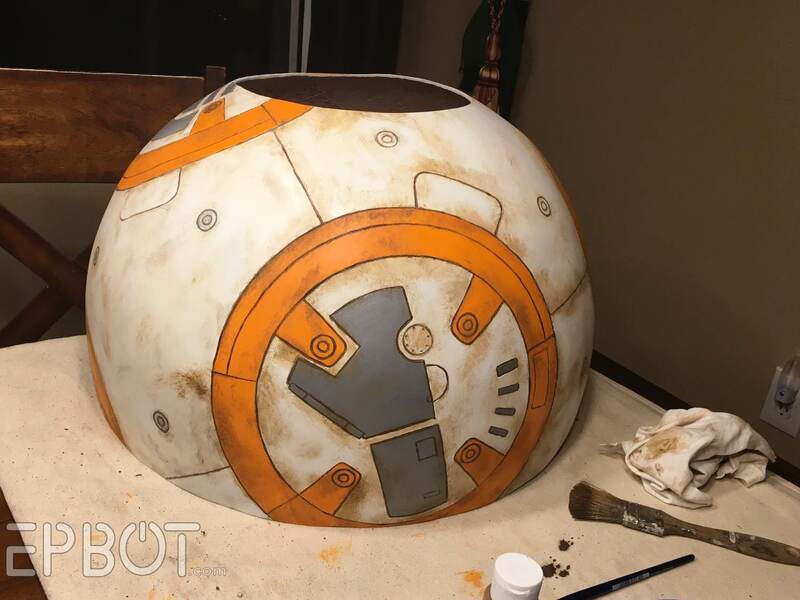 There's much more to our Project, but I thought BB-8 would be a fun partial reveal for now. Especially since he can be made separately! In fact, our droid is made entirely from common materials, and only cost around $50 to make, since we already had some things on hand. That's right, fifty bucks! 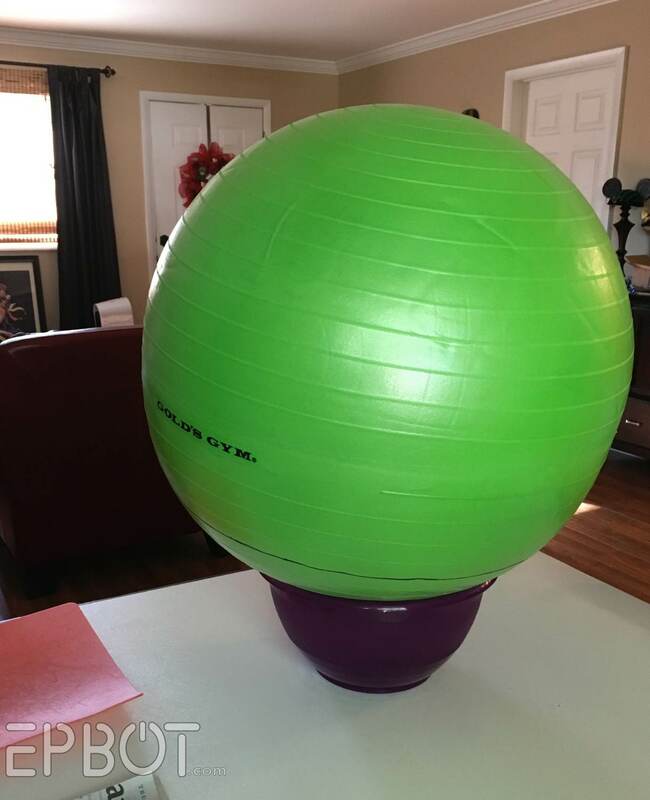 Make sure the air hole for each ball is on the BOTTOM, so it's still accessible later. Make the wrap as smooth as possible, without too many bunches. 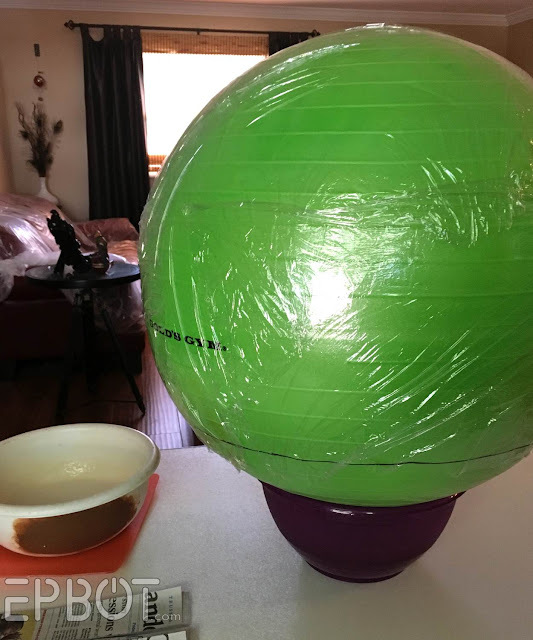 The wrap will allow you to remove the balls later. 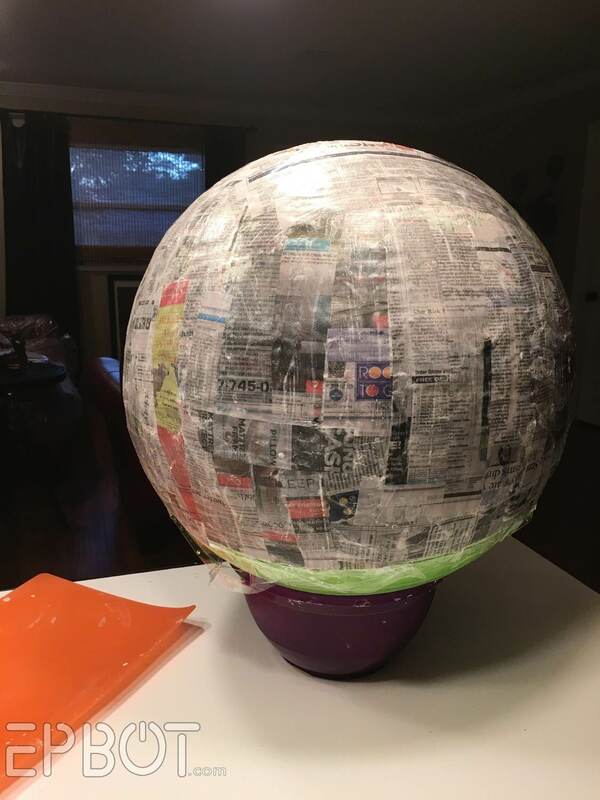 Next apply 4 - 5 coats of paper maché on both balls. For the head you only need to cover a little more than halfway down. It's up to you how much of the body to cover, though, since you can always leave a hole to be covered by the head later. Err on the side of covering more, though; you can always trim it later. 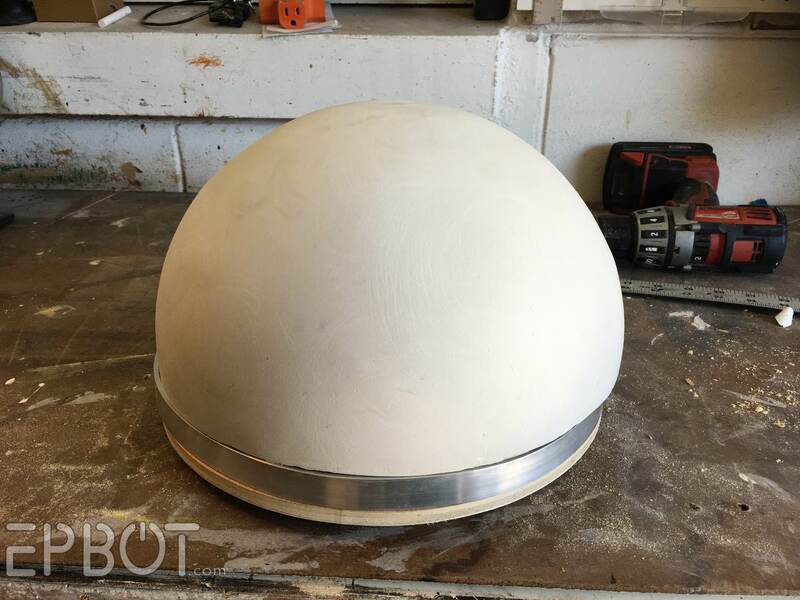 Apply a healthy coat of Bondo, spreading it as evenly as possible with a plastic smoothing spatula. It won't be super smooth (see above), but no worries; next, we sand! Once that's cured and sanded you can deflate & remove both balls. 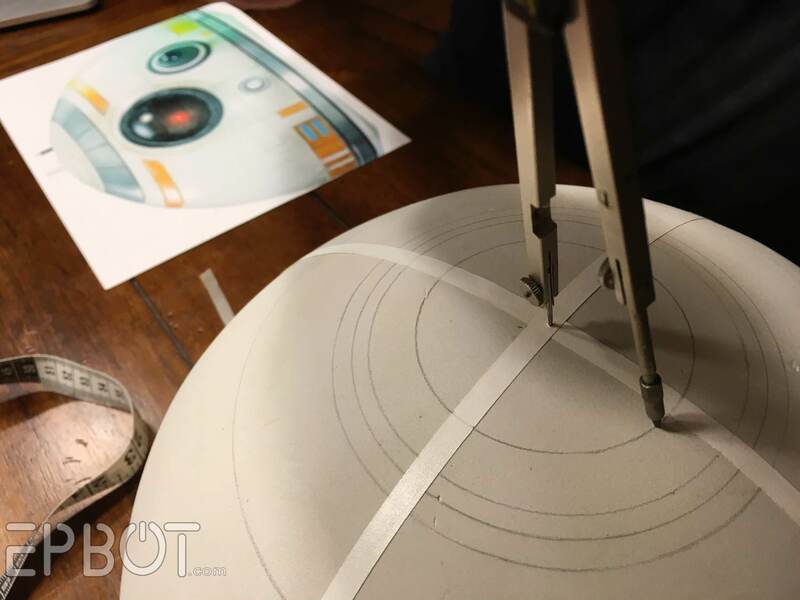 Trim the edges of both the head and body so they're even & perfect circles. You can find the aluminum at any hardware store, and the wood can be substituted with EVA foam if you don't have power tools to cut it. 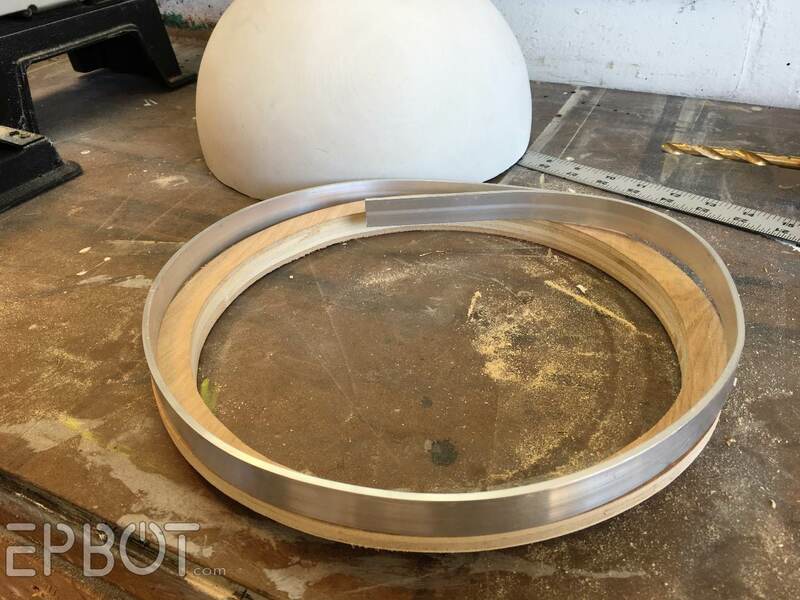 Later John added a thick ring of EVA foam under the wooden ring to make BB's "neck" - that angled section under his head. Note: You can stack 6mm craft foam to make thicker pieces; no need to buy a whole roll of EVA. 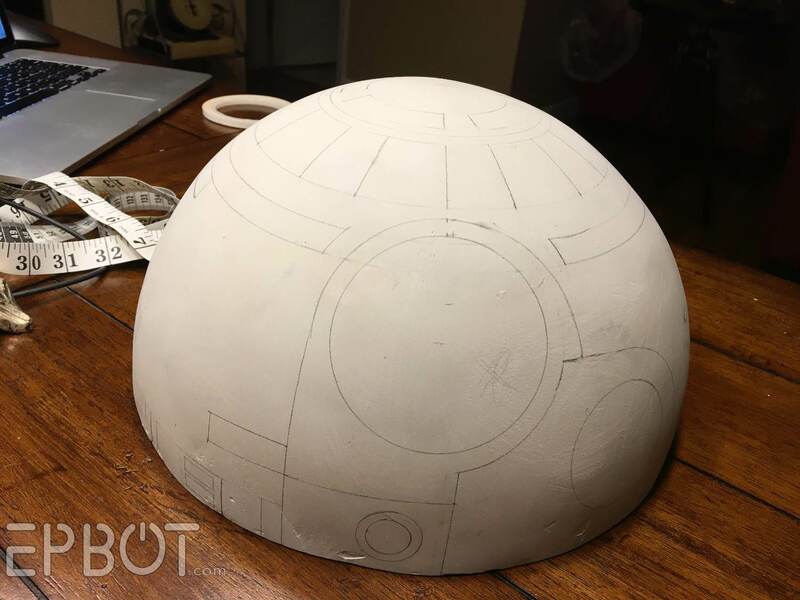 Print out as many reference photos as you can, and use a compass for all the circles and curves - it's a life saver. BB-8 is one of those things that seems simple until you stop to really look at it, at which point you sit down and cry a little, because HOLY COMPLICATED, BATMAN. Now comes the really tedious part - or at least the NEXT tedious part in a long line of tedium, ha. 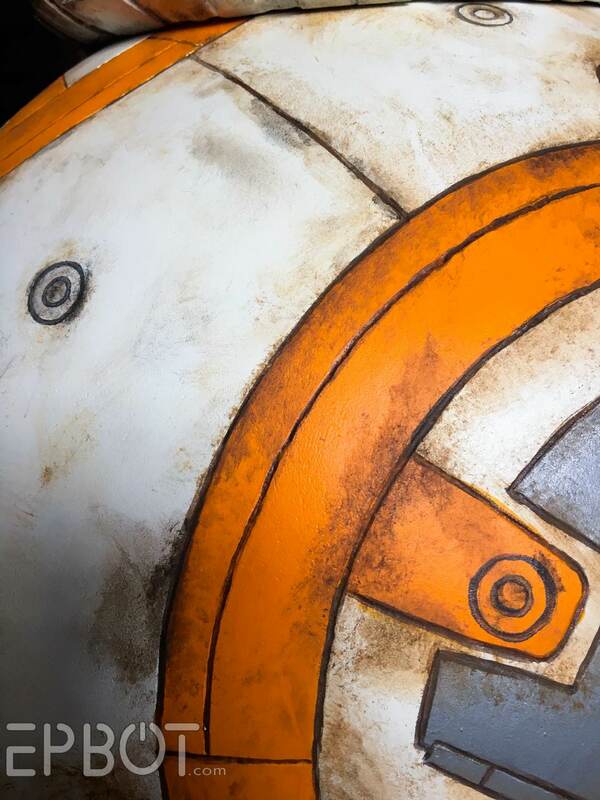 Get out your Dremel with the small pumpkin-carving bit, and go over every. single. line. I'll warn you now: your lines are going to look terrible. They'll be wobbly and jagged and though practice helps a little, the fact is they're never going to be perfect. But it's OK, I promise. It's not just you; everyone's lines look bad. The good news is it won't matter in the end, so just keep going. Take breaks to shake out your hand, though, because you WILL have a frozen crampy claw after a while. I spread this step out over two nights. 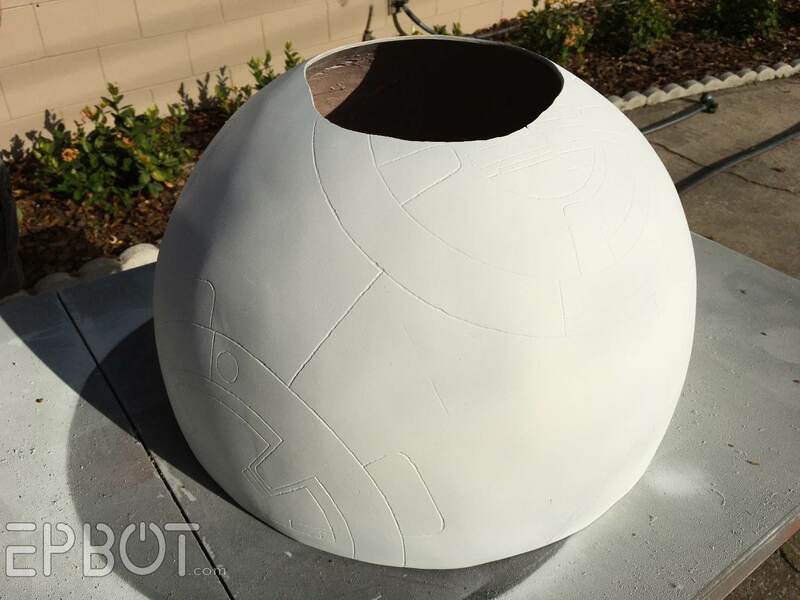 Or just use any white primer to lay down a nice base for the rest of the paint. 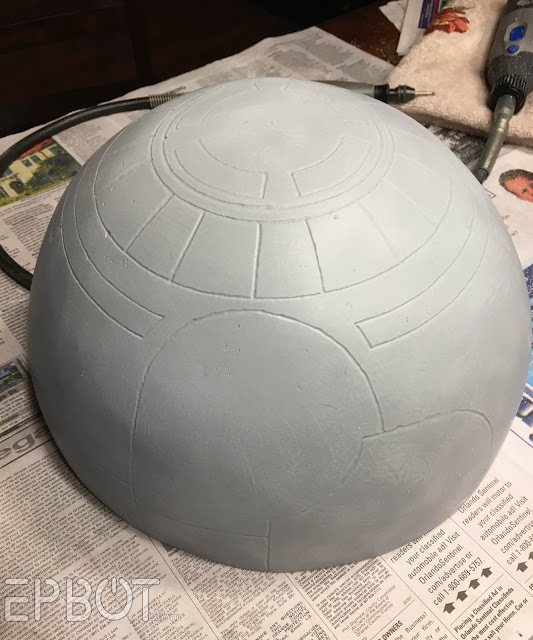 This will be the final coat for the white color, so make it a nice one - nothing too gray. 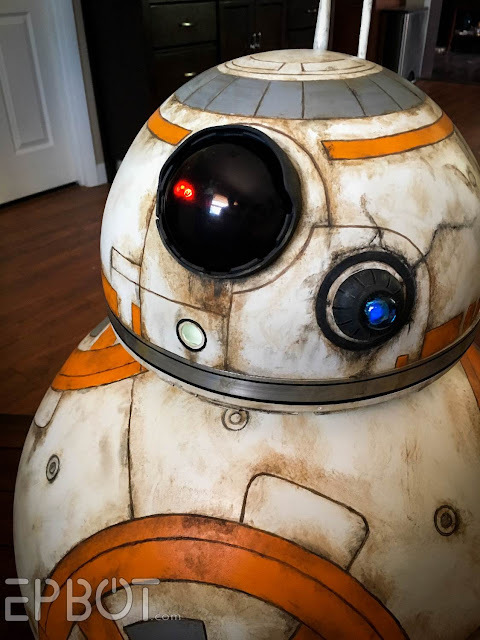 Pay no attention to BB-8's body cut in half over there. I said pay no attention!! I used a metallic silver craft paint for the gray sections, and more cheap craft paint for the orange - though we custom-mixed our own shade. I watered down both colors slightly and applied them with the softest brush I could find to minimize brush strokes. I'll warn you now, your BB-8 is NOT going to look good at this point. The wonky lines will be all in your face, taunting and yelling about how you're a no-talented, 2-bit hack. Ignore them. This is gonna work out, I promise. Look at me, waving these virtual pom-poms. You got this. 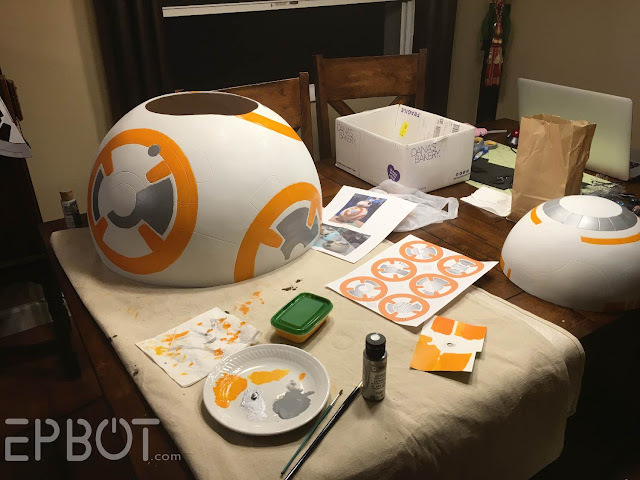 For BB-8's eye you'll need one of those plastic Christmas balls that come in 2 pieces from the craft store, plus some thin black craft foam. Some builders dye the eye cover black, others don't - it's up to you. We chose to dye ours using Polyster fabric dye. It didn't work very well (ours came out splotchy), but it DID work. 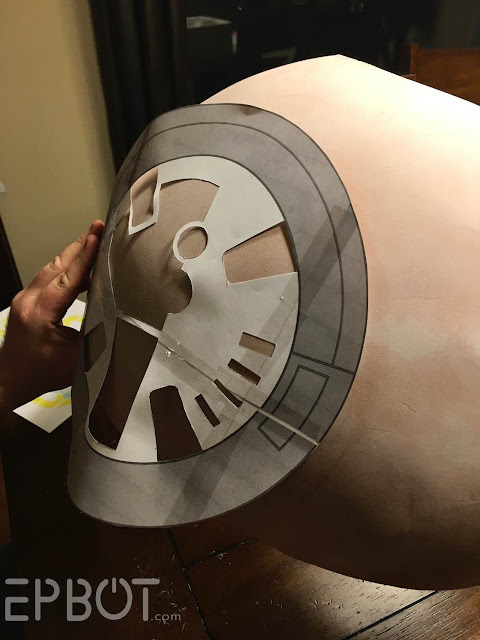 I'm sorry I don't have a template to share for his eye surround, because John just "winged it." He's talented like that. Yes, it's annoying. 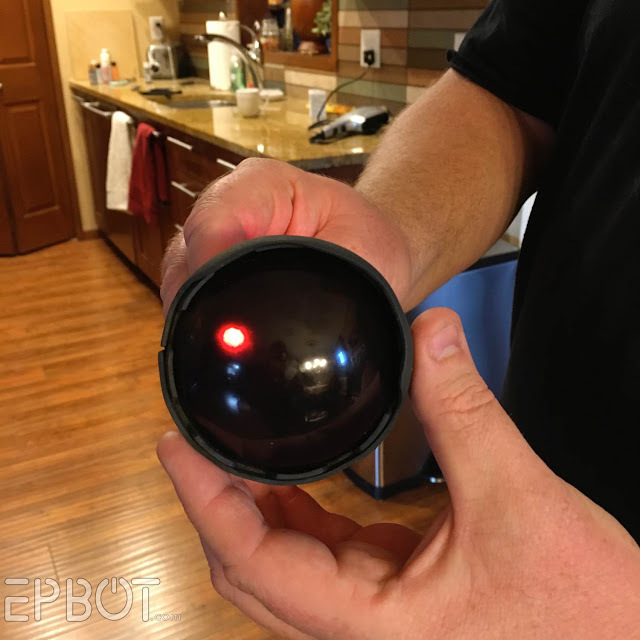 If you want the eye to light up (which it should), poke a single red LED through the back side of the foam, then tape on a button cell battery. BAM. 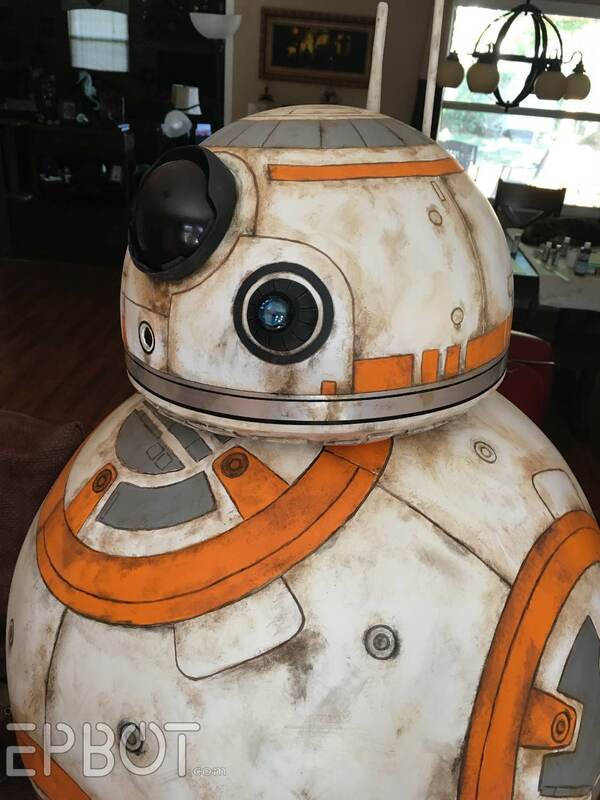 BB-8 is alive! 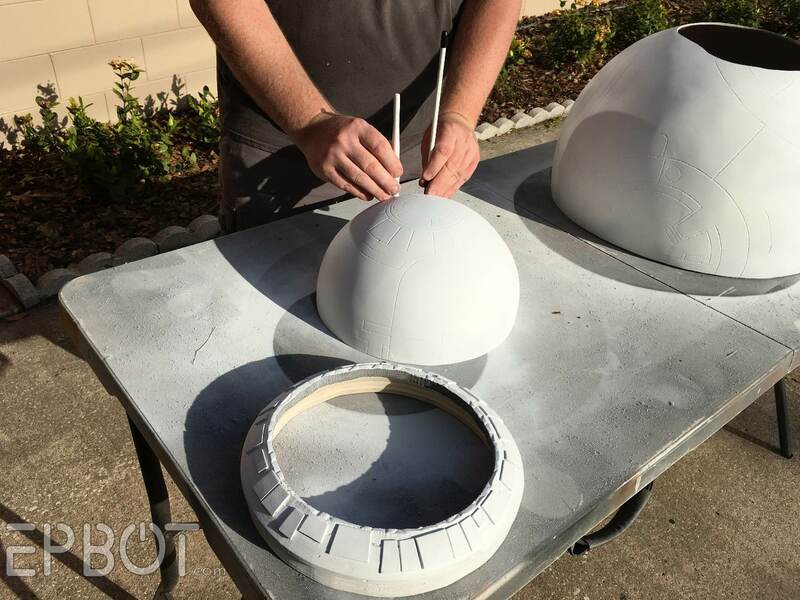 John made tiny slashes in the foam to make that beaded texture around the marble. So smart. Note: Instead of wood you could form that rounded base from paper clay, or even more craft foam, which rounds nicely when heated. I did the paint job to simulate the raised panels, and I'm not all that pleased with it. Still, when it's lit up and back a ways it gets the job done. You can always use painted wooden dowels though, and sand the tips to they're rounded. 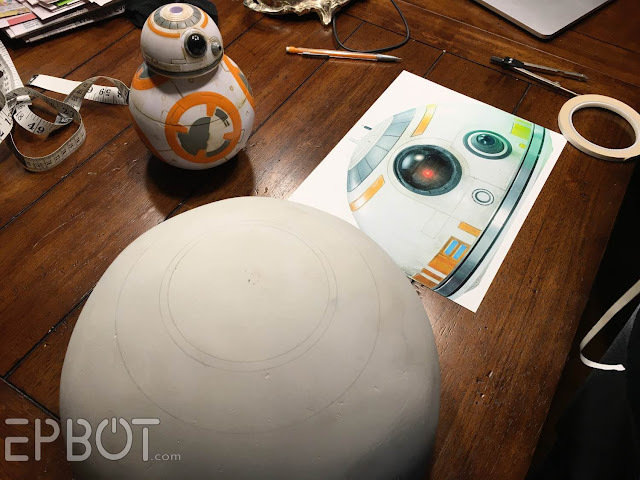 Drill holes in BB's head, poke 'em through, and glue down from the inside. 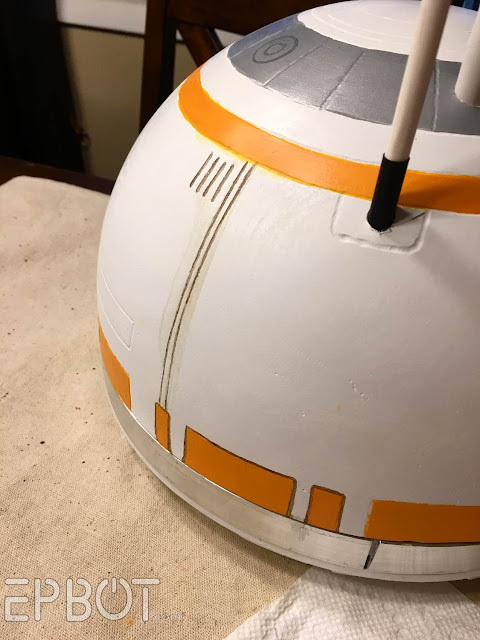 Make sure it's a satin spray, so BB-8 will have a nice metallic sheen. Now the fun part: AGING. Get a larger stipple brush and a rag, and concentrate your aging on the seam lines. 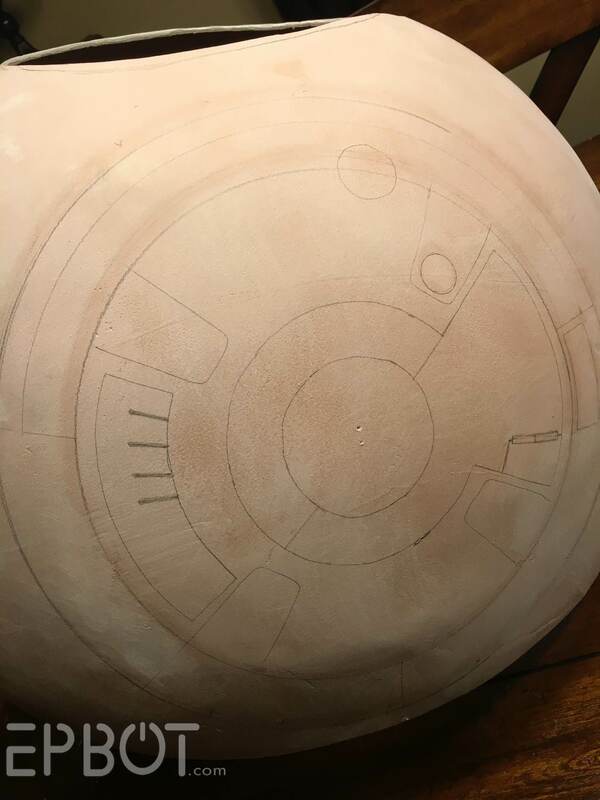 This helps camouflage the wonky lines, and also looks more believable, since dirt would accumulate there anyway. I find the best dirt color is a mix of gray and rusty brown, but have some areas of both colors for variation. 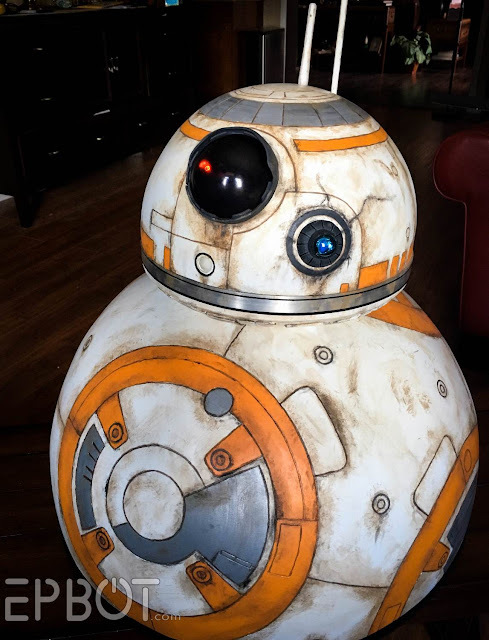 You can make BB-8 as clean or as dirty as you like, but given this is NOT a 3D printed version, I recommend some hefty aging to disguise any texture issues. Do leave some white areas, though, so you have nice contrast. 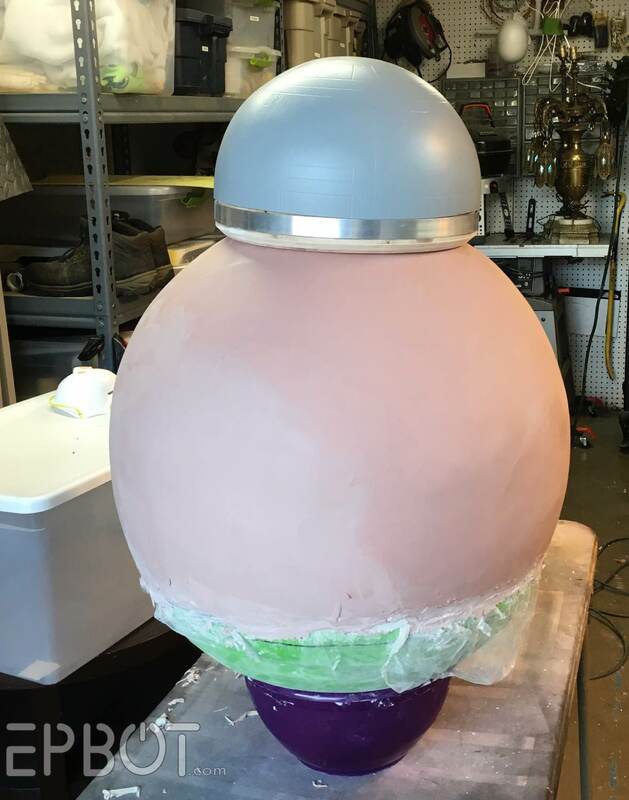 If he's evenly coated all over he'll actually look LESS dirty, and won't "pop" on camera. Now I'm going to tell you a sad tale with an OK ending. Ready? At this point disaster struck. John was moving something late one night while in a hurry, and BB-8's completed head (as seen above) fell six feet onto the hardwood floor, breaking badly. (HE WAS THE ONE WHO KNOCKED... his head.) BB's projector nozzle thingy hit hardest, resulting in several large raised cracks across the front of his face. It was somber time in the Yates' household, y'all. WEEKS of work, shattered in half a second. But after a moment of stunned silence we got out the superglue, fixed what we could, and set about turning lemons into lemonade. 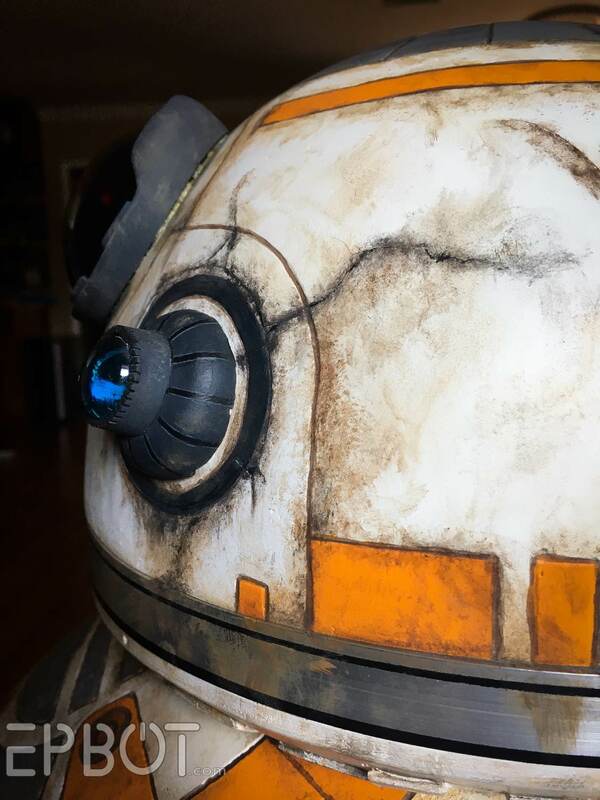 Now our BB-8 has some pretty badass scars, if I do say so myself. Instead of trying to hide what couldn't be hidden, I sealed and then emphasized some of the damage - even adding a few more cracks, in fact, so it would look intentional. The rest I hid as best I could under more layers of grime. That's actually another crack - can you tell? His projector has a dim blue LED, and the little circle under his eye is lit with a frosted piece of acrylic. (Pro tip: sanding clear plastic "frosts" it.) If electronics scare you, though, just go with the single red eye; it's by far the most important. Hope you guys enjoyed the virtual walk-through! I know this wasn't a complete tutorial, so feel free to ask questions in the comments. And as always, if you make your own PLEASE share over on Facebook; I wanna see! Want to see ALL of my tutorials and project build in one place? Then head over to the Craft Page! Love your posts. Love the stuff you make. 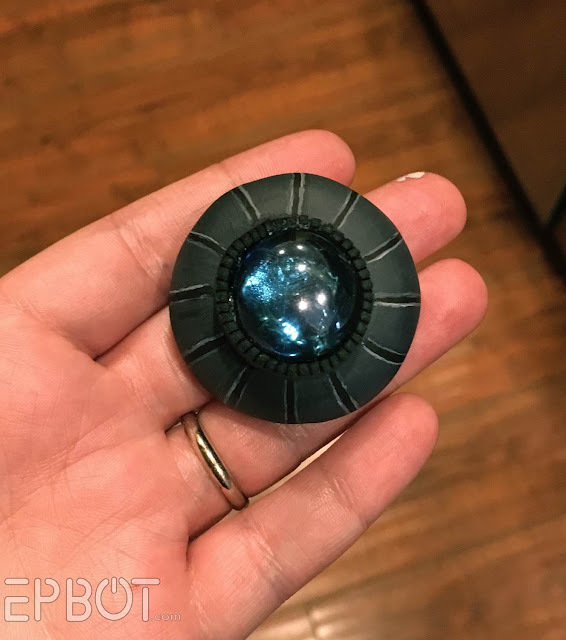 I just don't have the energy (emotional or mental or otherwise) to put into crafts, or home improvement, or anything of that nature, and I really wish I did. So for now, I'll just live vicariously through your stuff. :) My heart was hurting for you about the break, though. Been there, baking-wise. Ugh. Glad you were able to creatively salvage it! Love it. He looks fantastic, as do all of your builds! Wonderful! He looks amazing! I think you should do a tutorial on distressing...mine always looks like smears not aging. You guys never cease to amaze me with your creativity!!! He looks fantastic!! Please tell me you'll be at Celebration on Thursday?! 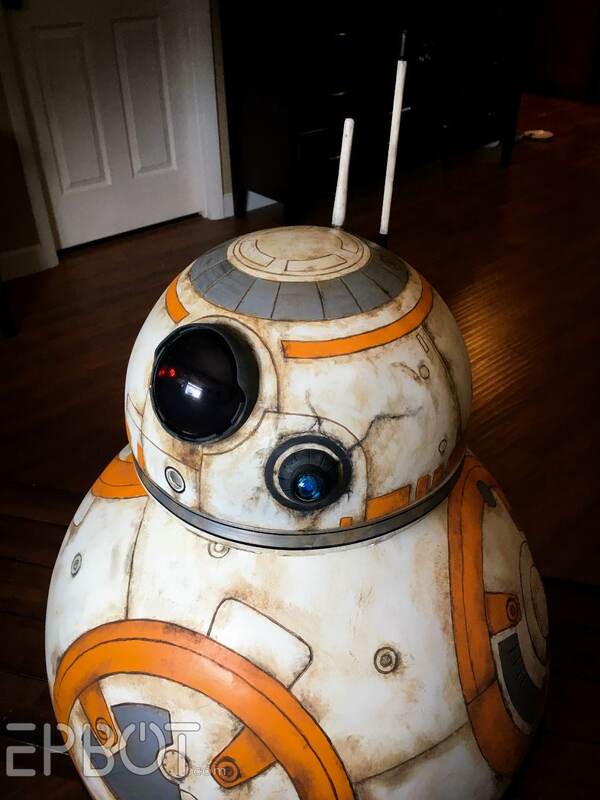 Our 3yo daughter is coming dressed as Rey and would be beside herself excited to get a picture with your BB8!! She's been listening to the movie soundtrack everyday and is getting really excited for Celebration (we've showed her pictures from our trip to the 2012 Orlando one, but missed finding you that year). Hi Cara! We haven't decided which day(s) BB will be out, but Thursday is a strong possibility, since the crowds will be less crazy then. (Offhand I'd guess we'll have him out Thurs & Sunday.) I'll try to announce here on the blog when we know the days for sure! That is awesome! The aging is perfection! Thanks as always for sharing the how to. 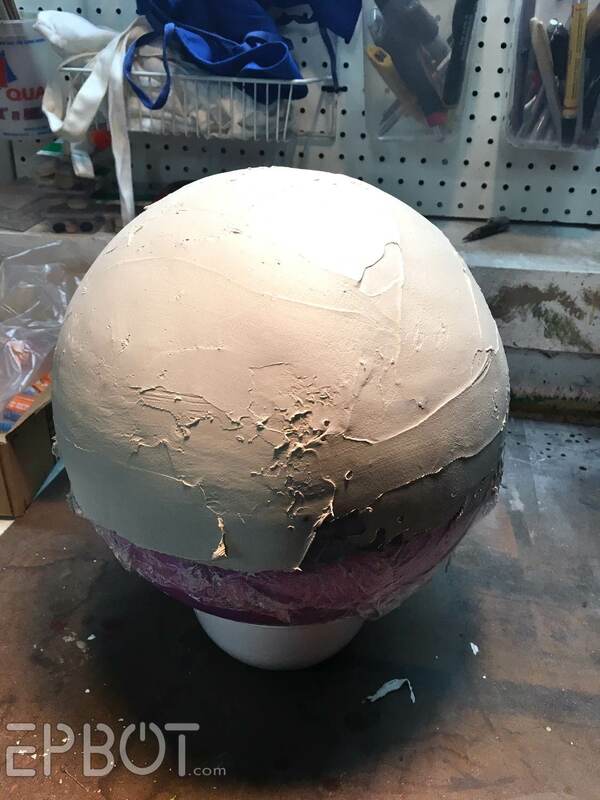 Now I have a sudden urge to go buy Bondo and exercise balls! He's so adorable! Can't wait til you show off all he can do when you're done! Wow - another project well done! 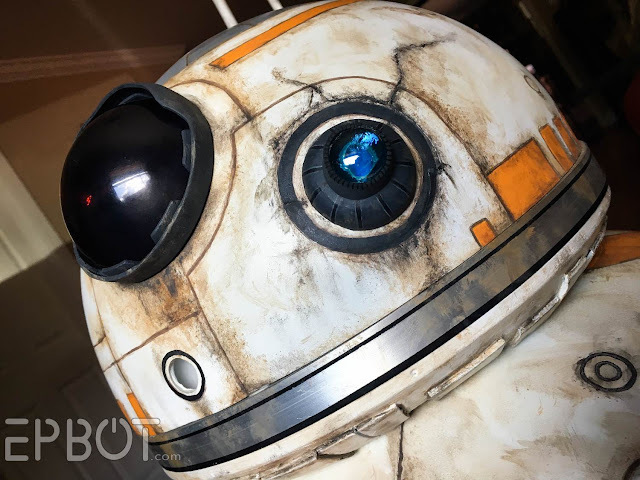 Love how you turned an accident into battle scars for BB8. Thanks for the breakdown of how you two put him together. you are both wildly talented! your bb is magnificent! and i actually love his scars. the are unique and give him character! Awesome job guys! 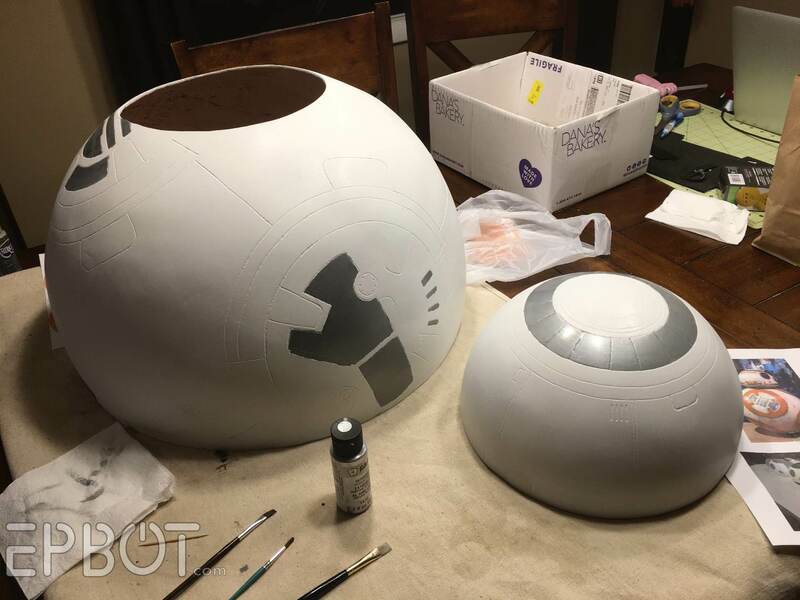 I swear, you two are miracle workers with paper mache, between this and figment, is there anything you can't make? And your solution for the crack was great, I think it looks more brilliant cracked like that. Perfect. I'm preeeetty sure he'll be coming with us to DCon, yes! YAY!! I'll have to make sure I wear my Jyn costume that day and find you guys!! The "scars" are giving me some serious Mad Eye Moody vibes and I love it! WOW! 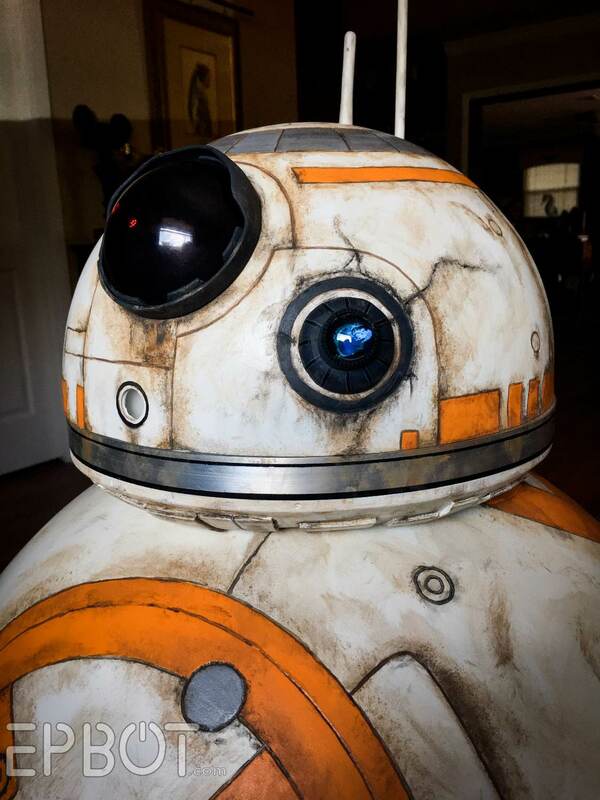 BB-8 looks amazing. 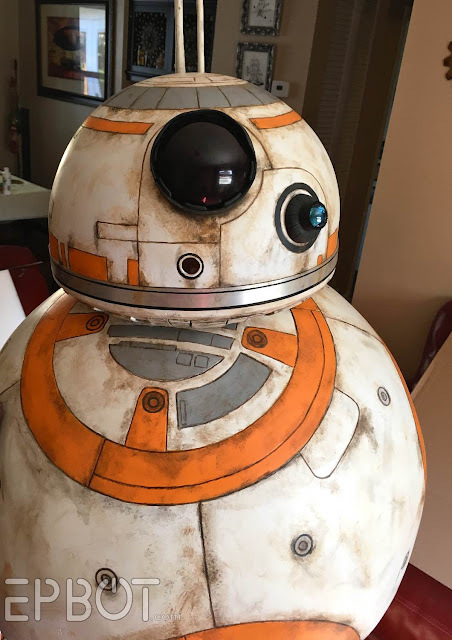 I think he looks even better with the scars. 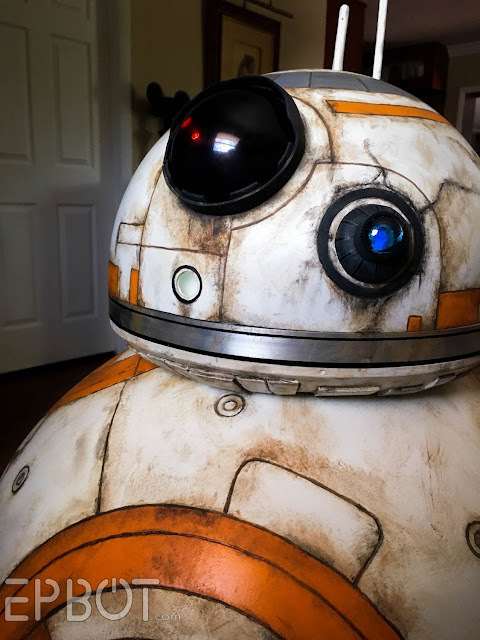 He's not some pristine droid; he's seen some action. Thanks for the heads up on his potential show days! We figured the same, Thursday would be kid friendly so she'd be less likely to be overwhelmed by the crowds. Here's to hoping we finally get to meet you! Seriously impressed. I love how you two imagine these things up - that's a special gift to have that kind of vision. I love it! 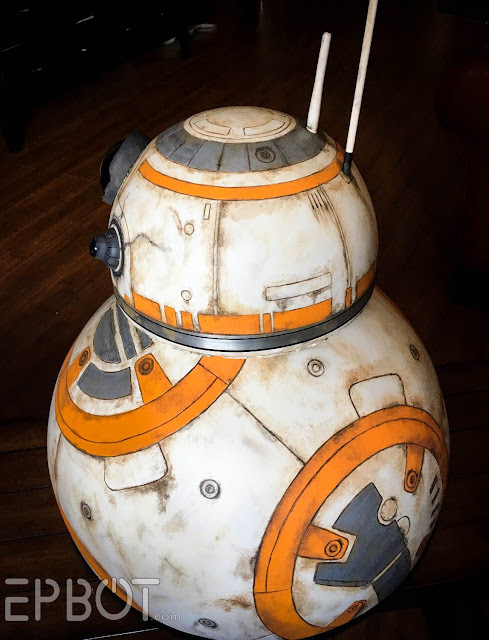 I have a weird BB-8 obsession (my favorite color is orange so start there) and I think I'm going to have to make my own. Not going to lie though, I got very confused when I saw the reference to Skycraft (we call it skycrap.) I forget y'all are in Orlando and couldn't figure out why (or how!) there would be two of them. That is the best.... place.... EVAR! I go in there all the time buying bits and bobbles for my various projects. I also love the cracks. After all what they know and what you know are always two different things. Battle damage is epic. He looks so awesome! I'm a longtime reader of this and cakewrecks, first time commenter, but I'm all excited about my first time going to Celebration and I'm hoping I'll get to see BB-8 in person there. This is amaze-balls! hee hee - GET IT?? 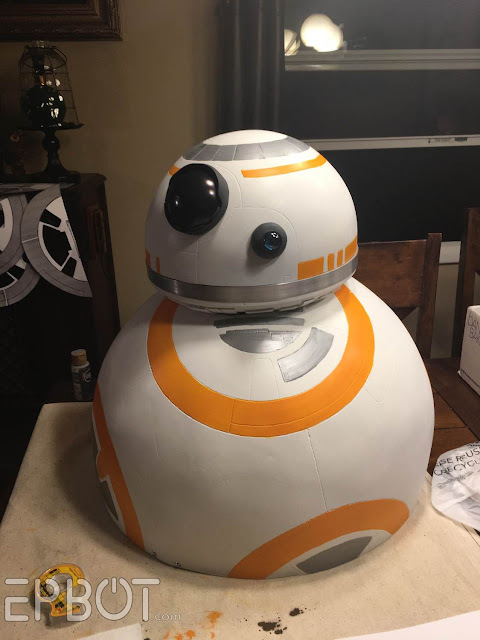 Question (and forgive me if you already answered it): If BB doesn't roll, what is your plan to maneuver him throughout the con? Part of me is going: Wow, I could make that! Another part of me is going: Are you crazy, you hardly have time to cook decent meals for you kids, how are you going to find time to make that?! Guess I'll just continue to live my life through Epbot for a few more years. OMG!!!! 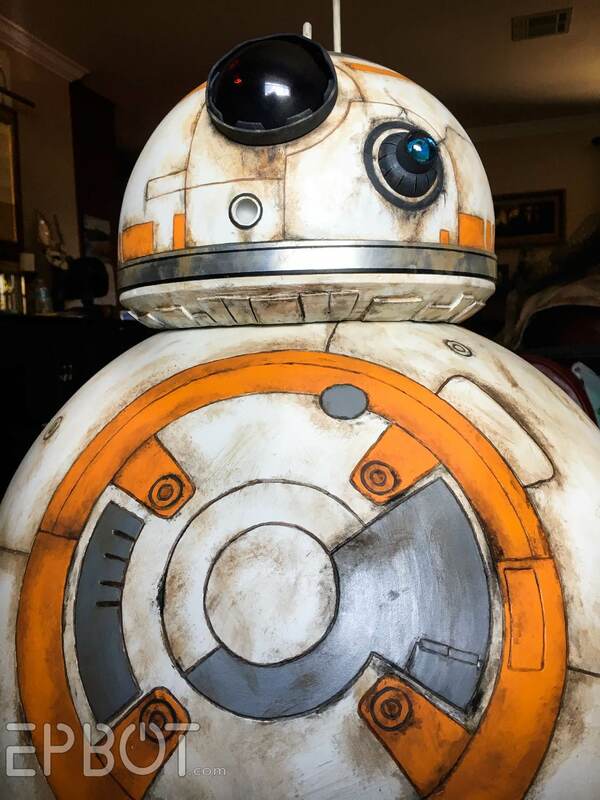 I am so making one for display in a dead space in our home theater. I am singing your praises right now because yours is by far the best and easiest plan I've seen. I only wanted a simple static one for ambiance and I'm a a crafty artist so this right up my alley. I am attempting to make one now and I got to wondering....how is head attached to the body? Just glued on?